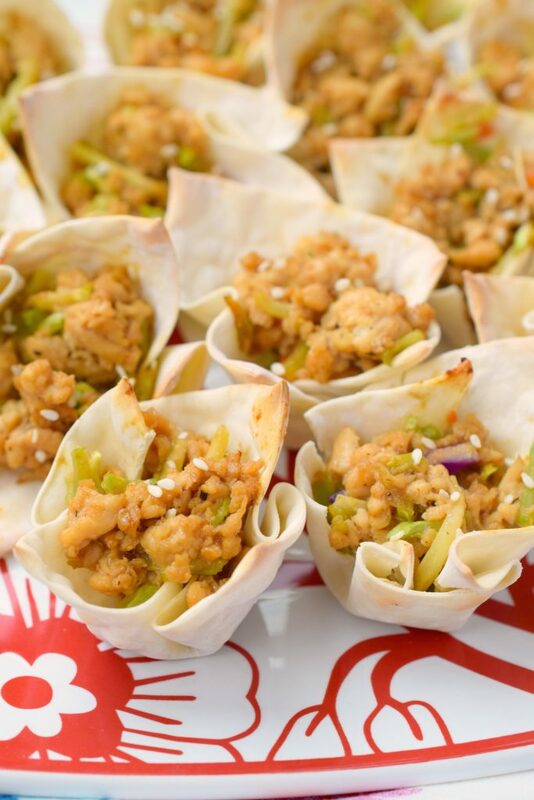 Asian Chicken Wonton Cups are a delicious way to enjoy a bite-sized bit of your favorite flavors. 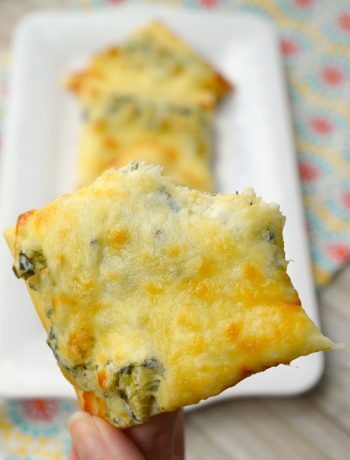 Great for parties or game day, you’ll simply love them! 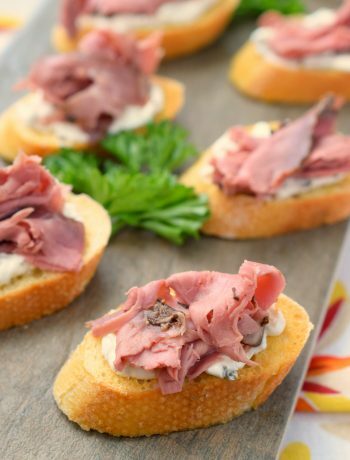 We’re back with another delicious bite-sized nibble that’s perfect for parties, BBQ’s, game day or holiday spreads. Asian Chicken Wonton Cups are loaded with flavor and so easy to make, I love them. 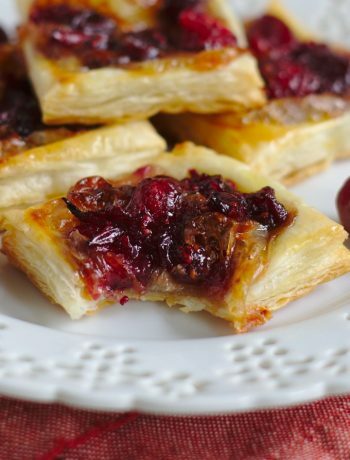 To be honest, I could actually eat these as a light meal, pair with a glass of white wine and I’m good to go! They begin with ground chicken, cooked in sesame oil. As the chicken cooks away I added in some Hoisin sauce to give the chicken a nice flavor. Once that mixture cooked, it is then added to chopped broccoli slaw and some Teriyaki sauce to bring everything together. The wonton wrappers get popped into the oven for just a couple of minutes then filled with the mixture. Sprinkle with sesame seeds and pop back into the oven. 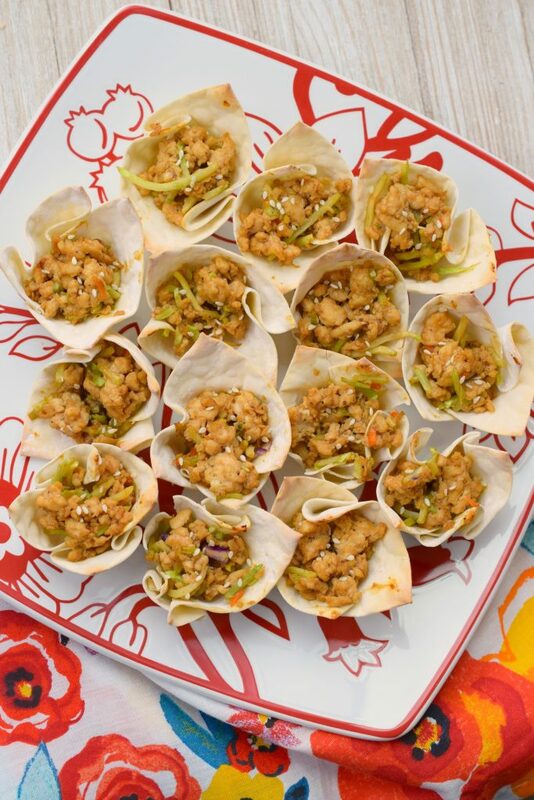 You can also add chopped dry roasted peanuts, or sliced green onion on top of the wonton cups to finish them off. If you are a fan of spicier dishes you can certainly add in some red pepper flakes or Sriracha before filling the wonton cups. Be sure to have either additional Teriyaki sauce for dipping available or even soy sauce. What else can you use wonton wrappers for? Spicy Sausage Wonton Cups | Who Needs A Cape? 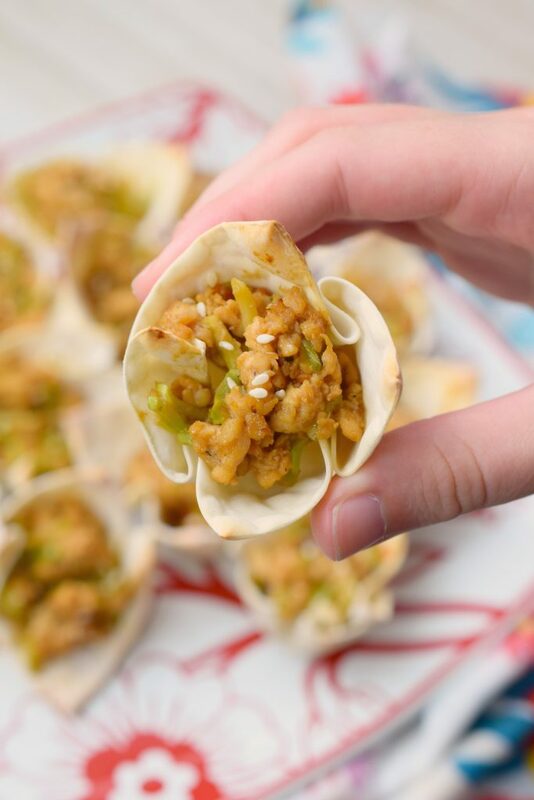 Asian Chicken Wonton Cups are a delicious way to enjoy a bite-sized bit of your favorite flavors. Great for parties or game day, you'll simply love them! Place wonton wrappers into mini muffin pan, gently pressing down and to the sides with a small spoon. Bake 5 minutes until lightly browned. In non-stick skillet heat sesame oil over medium-high heat, add ground chicken and break apart while cooking thoroughly. Drain once cooked. Stir in Hoisin sauce and heat through. Stir broccoli slaw into chicken mixture, add in Teriyaki sauce and stir. Using small cookie scoop place filling into par-baked wonton wrappers, sprinkle with sesame seeds if desired. Return to oven and bake approximately 5 minutes until filling is warmed.